It was recently shown by others that NG2 glial cells (OPC) make synaptic contact to neurons in vivo. This was revolutionary as it was thought that such specialised synaptic domains were only formed between neurons. We are studying these glial-neuron synaptic contacts in vivo and in vitro: our aim is to define the components of these synaptic contacts and understand the physiological role of these glial-neuronal synaptic interactions. 3d reconstruction of a confocal laser scanning microscope image (CLSM). 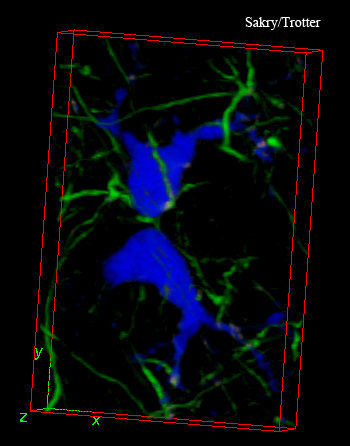 Two newborn OPCs (blue) and surrounding axons (green).